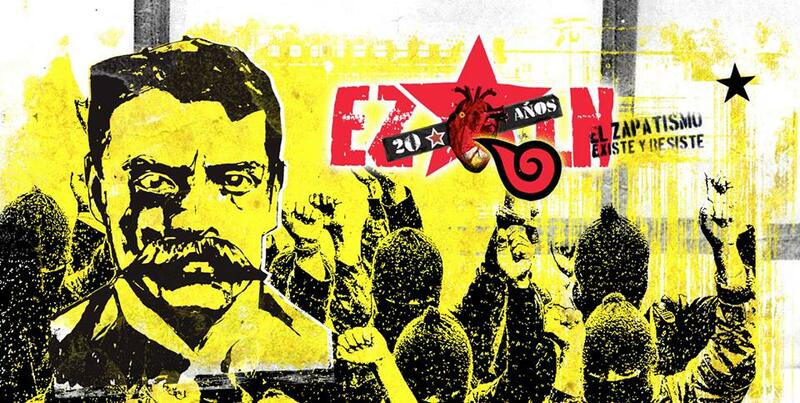 Rebelsounds and Latino resiste present EZLN: 20 Years. For many of you, the Zapatista is just a part of the iconography that has been going around from actually mid 90’s and slowly got into a more fashionist way of being rebellious. For many of those who were in the actual jungle, 20 years ago, it was their time to face the biggest enemy any indigenous group can handle: Their own government. It is amazing how just few hundred of campesinos (farmers) who are direct descendants of the Indigenous tribes that once populated the whole American continent achieved to get a highlight in their struggles in a pre-social media era, putting in evidence the corruption and mischievous way of governments to treat their aboriginal communities. The Zapatista represented not only the Mexicans; they represented the whole continent’s struggles. 20 years ago, the whole planet moved even for a slip of a second to that jungle, and the gov, didn’t have any other choice that listen to their demands, because they knew everyone was paying attention. Back in those days ; many artists decided to paint a musical landscape in support of that community. Jungle, Mestizo, Cumbia, and Rock-grunge were killing it. 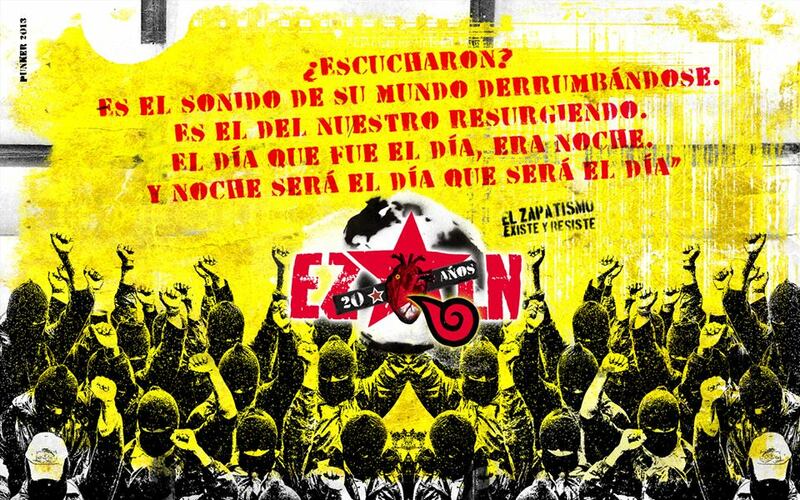 So the first musical compilations that supported EZLN, came from that direction, bands like Rage against the Machine, Manu Chao, Asian Dub Foundation, Fermin Muguruza, Sergent Garcia, and many more decided to add their music and got inspired by their fight. The campesinos struggles are exactly in the same spot. Although many things changed, and let’s be fair; In many ways, there had been a slight improvement; In reality; 20 years after, the power pyramid remains intact. New struggles came in these 2 decades, from cultural appropriation to Land given to the corporations for mining purposes, to the actual selective killing of Indigenous political members; these communities keep facing five centuries of oppression. We also now have learned we are not going to win, or change anything drastically in the political landscape of these countries. But we bet all of our efforts to let the system know, that we will do anything in our power to reverse these situations. There have been many small changes all separated, that when you add them up, they create a whole context for the Indigenous communities and empower them. From the Bolivian refusal of using genetic modified seeds, and kicking out McDonalds, to the name drop of a local sport team in Canada in where a disrespectful name and mascot made very uncomfortable aboriginals and their families; to the actual legal fights in Brazil for the Amazon territories passing thru Colombian or Chilean strikes, this Zapatista fight represent everyone! Not just the Mexican, but the whole continent. And we needed to be consequent with today’s musical landscape, but we still need to keep a tight relation with the initial movement and their supporters since day one. That is why we are extremely happy to announce for the first time ever, we can get together pioneers and current legends, as well as a whole bunch of big names, and obviously in Latino Resiste style unveiling unknown producers, but equally talented. Because this is not about names, this is about the fight, the struggles; it is about connecting young people, of this moment of history, with this particular issue. The compilation starts with Indigenous Resistance & Asian dub foundation dropping their super killer track, Esta tierra no esta a la venta ( This land is not for sale). Then we strike with A Tribe Called Red joining Mexican producer Javier Estrada, for a fast-paced super crazy track called Indigenous Power, in where Pow Wow meets Tropical Bass. Next; Being an “all star” project from pretty much every big underground band of Colombia supporting the Campesino Strike, Papa con Yuca is the perfect track to show Indigenous support meets Musical richness. Less known, but equally talented, Chilean Mr Toé and Dj Subversivo, spent a great amount of time in the actual Jungle, learning from Aboriginal tribes, and living with them before going back to civilization and start mixing those experiences with music. 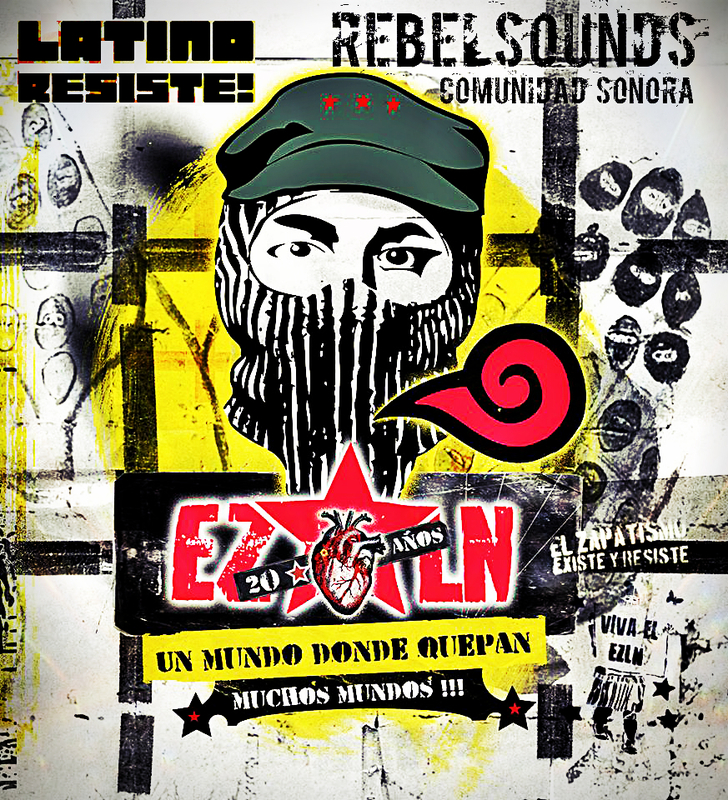 Rebelsounds founder members David raga submitted that Jose De Molina badass track that represent perfectly his knowledge about the actual Zapatistas, and the original EZLN members musical taste, as well as the most radical side of the political spectrum. The whole Booklet is AMAZING, art was made by Rebelsounds’ art director Punker, and the actual EZLN political support is given from Rebelsounds’ very own Hannibal whose mestiroots are having the official blessing from EZLN sympathizers. FREE. We know.. from a credible source, Mexican and actually few South American govs will try to take this one down, as it distorts the reality they want to sell it thru the media. REBELSOUNDS & Latino Resiste! Aguante la lucha Indigena!